From June 26th-27th, 2018, the DFG Transregio 124 FungiNet Consortium convened in Würzburg to present and discuss the very latest research advances on the interactions of pathogenic fungi and the host immune system. 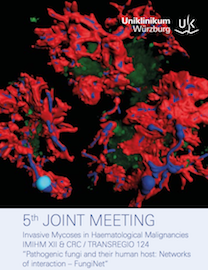 This meeting provided the opportunity especially for young pre- and post-docs of the FungiNet Consortium to share their very latest research data in own sessions prior to the 12th International Meeting for Invasive Mycoses in Haematologic Malignancies (IMIHM XII) organized by Prof. Jürgen Löffler. The topics covered aspects of immunology, microbiology, clinical mycology as well as basic science. Postdoctoral fellow Zeinab Mokhtari from the Beilhack lab presented the progress of two key research projects in the FungiNet consortium. The vivid discussions continued with internationally renowned experts in the field of fungal infections at the IMIHM XII, when they presented the most recent developments in fungal research covering topics from fungal recognition receptors and inflammasome signaling to clinical challenges based on the emergence of fungal multi-drug resistance. The FungiNet Research Consortium under the leadership of Prof. Axel Brakhage is a joint interdisciplinary endeavor of researchers from the Universities of Jena and Würzburg and funded by the Deutsche Forschungsgemeinschaft (DFG). In 2017 the DFG extended its support for this research network for the next 4 years. Program and pictures of the 5th Joint Meeting of the DFG TRR 124 FungiNet consortium and IMIHM XII. The annual meeting of the immunology programs from Würzburg, Erlangen and Tübingen Universities took place in Obertrubach, Franconia. This year’s meeting was organized by Hans-Martin Jäck and his team from the University of Erlangen. From June 18th-20th, 2018, the 13thnetwork meeting of research training groups in immunology from the Universities of Erlangen-Nuremberg, Tübingen, Würzburg was held in the Obertrubach, a pristine place in the Veldensteiner Forst with its characteristic 120 million years old rock and karst formations. For three days, graduate students and faculty members met to present and discuss their research projects in a relaxed atmosphere. Already in the past years, this meeting has proven as a great opportunity to share new developments and concepts and to foster scientific collaboration. Highlights of this year’s retreat were the keynote lectures by Dirk Brenner (Luxembourg) and Marco Herold (Melbourne). Marco Herold, who is holding now a faculty position in Australia at the Walter and Eliza Hall Institute, had graduated from Würzburg University and is a former member of the Würzburg immunology graduate program. Musga Qureischi and Tim Steinfatt from the Beilhack lab gave lectures about their progress and Julia Hartweg, Haroon Shaikh and Leni Strobel presented their thesis projects in the poster session. 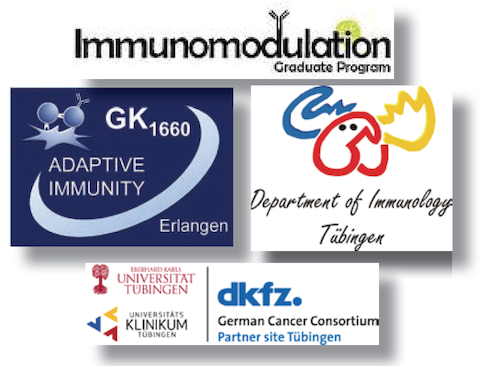 All PhD students of the Beilhack lab are members of the graduate program Immunomodulation, which is integrated in the Würzburg Graduate School of Life Sciences (GSLS). Graduate students of this program are required to give at least one poster and one scientific presentation at this annual immunology network meeting. The foundation “Help in the fight against cancer e.V.” awarded Dalia Sheta, a talented master student in the Beilhack lab with a scholarship of 3,000€ for the year 2018. T his scholarship honors the great commitment of Ms. Sheta for research at the University Hospital Würzburg. In a ceremony on May 18, 2018, Prof. Dr. Georg Ertl, director of the Würzburg University Clinics, and Ms. Gabriele Nelkenstock, initiator and chair of the two foundations for cancer research, handed over the award to Ms. Dalia Sheta. The immune system, a tightly knit network of cells, tissues and biochemicals that they secrete, defends our body against fungi, bacteria, viruses, and other invaders. But cancer and some infections often find ways to hide from the immune system or block its ability to fight. The 5th international Else-Kröner-Symposium “Translational Immunology – From Target to Therapy V” took place in Würzburg to exchange the newest research and clinical data on novel approaches to foster the immune system to prevent and treat human diseases. This year’s symposium from April 12-13, 2018, was organized by our young physician-scientists in training of the Else-Kröner-Forschungskolleg for Interdisciplinary Translational Immunology. They are ten selected and associated fellows from different medical disciplines (cardiology, dermatology, gynecology, hematology-oncology, internal medicine, urology and nuclear-medicine). On top of their training in their respective medical fields Else-Kröner-fellows participate in a structured program for translational immunological research. As part of their program they are also organizing an annual symposium, “Translational Immunology – From Target to Therapy”. At this event supported by the Else-Kröner-Fresenius-Stiftung there is the opportunity to listen to leaders in translational immunology research from all over the world and to present and discuss their work with these international experts in immunodiagnostics and -therapy. Immunotherapy tries to help the immune system recognize cancer or infections as a threat, and attack it. Although many approaches to harness our immune system are investigated two promising types of immunotherapy have entered clinical cancer therapy. One creates a new, individualized treatment for each patient by removing some of the person’s immune cells, altering them genetically to kill cancer and then infusing them back into the bloodstream. Although this treatment has so far been still limited to hematological malignancies, it has resulted in long remissions in a few hundred children and adults with deadly forms of leukemia or lymphoma for whom standard treatments had failed. The second approach, which is now being widely explored in all forms of cancer, involves mass-produced therapeutic antibodies that do not have to be tailored to each patient. These biological drugs foster immune cells to fight cancer by blocking a mechanism — called a checkpoint — that cancer cells abuse to shut down the immune system. Beside immune checkpoints and genetically engineered T cells, the symposium covered many other topics, from autoimmune disease to neuro-immunology. Again, this year’s Else-Kröner-Symposium provided a great platform to listen to and interact with international leaders in cancer immunotherapy, inflammation, autoimmune and infectious diseases. The list of speakers included Philipp Beckhove (Regensburg), Mark Coles (Oxford), Angus Dalgleish (London), Wilfried Ellmeier (Wien), Manuel Friese (Hamburg), Thomas Gebhardt (Melbourne), Audrey Gérard (Oxford), Michael Hölzel (Bonn), Alexander Kerster (Rehovot), Christopher Klebanoff (New York), Thomas Korn (München), Jens Stein (Bern), Viktor Umansky (Heidelberg), Sjoerd van der Burg (Leiden), Hans van Eenenaam (Nijmegen) and Robert Zeiser (Freiburg). Again this year one physician scientist in training and one PhD researcher were awarded with a poster prize. This year’s awardees are Dr. Tanja Stüber from the Department of Obstetrics and Gynecology and Dr. Duc Dung Le from the Beilhack lab – Congratulations to our young scientists! On March 17th, 2018, the new cancer research foundation Forschung hilft! (Research helps!) invited to a charity concert by the German Doctors Orchestra in the grand concert hall of the conservatory of Würzburg University. The wonderful performance started with Carl Maria von Weber’s overture Master of the Spirits. Conducted by Alexander Mottok, Weber’s music shined brightly. The concert eclipsed with Elisabeth Müller’s stellar performance of Camille Saint-Saëns’ impressionistic violin concerto No. 3. Standing ovations after Robert Schumann’s 3rd symphony were rewarded with a special feature of Alexander Mottok’s own composition. – A fine evening indeed! The German Doctors’ Orchestra was founded in 1989. Its 150 members are predominantly medical doctors of all disciplines but also pharmacists, nurses and medical students. Many of them have a professional musical education. The orchestra consists exclusively of volunteer musicians and are led by Alexander Mottok, a freelance conductor. For more than ten years, the orchestra’s hallmark has been to perform charity concerts at the highest musical level. The new foundation Forschung hilft! – Research helps! supports promising research projects and extraordinary achievements of scientists at the University of Würzburg, for example through scholarships. Invigorated by the crowdfunding campaign “Your Immune System Becomes Your Weapon Against Cancer”, Würzburg’s foundation “Hilfe im Kampf gegen Krebs” donated €100,000 to the new foundation when it was founded in mid-December 2017. Since then, Forschung hilft! aims to achieve its goals through donations. The Beilhack lab’s research approach has been selected by this charity to propel immunotherapy for cancer treatment. 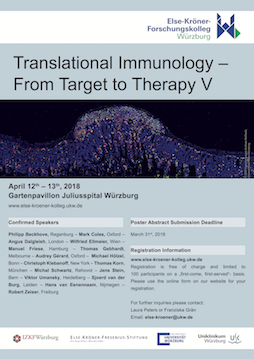 From April 12th to 13th, 2018 we are organizing the International Else-Kröner-Conference “Translational Immunology – From Target to Therapy V” at the beautiful historical venue of the Juliusspital in Würzburg, Germany. The Symposium is organized by the Else-Kröner-fellows of our physician-scientist training program of interdisciplinary translational immunology. Würzburg’s Else-Kröner-fellows are ten selected and associated young physicians from different medical disciplines (cardiology, dermatology, gynecology, hematology, internal medicine, oncology, pathology, urology and pediatrics) who are engaged in a structured translational research training program lead by Prof. Andreas Beilhack and Prof. Jörg Wischhusen. 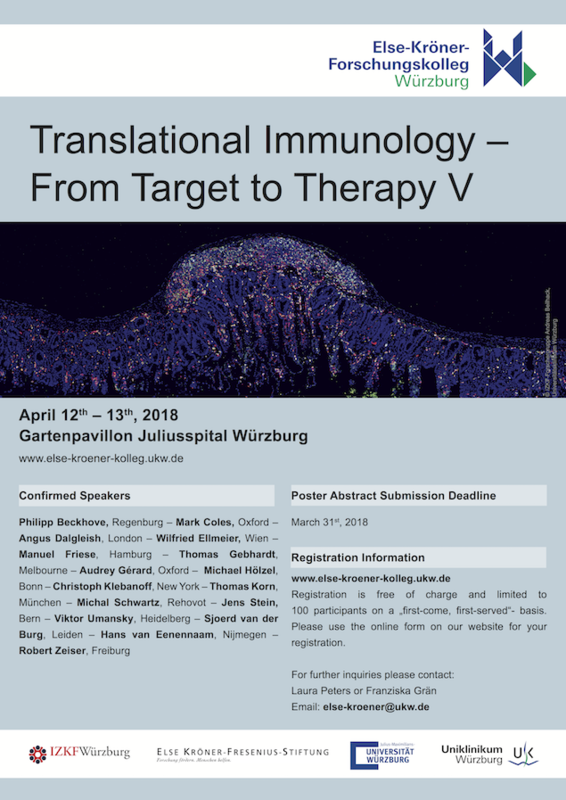 Once a year the fellows organize the conference “Translational Immunology – From Target to Therapy”, where they can present and discuss their work with international guest speakers who are leaders in translational immunology research. You would like to participate? – Register here! This week, the Beilhack Lab conducted an intensive training course in immunology for the trainees of our DFG research training group RTG2157 “3D Infect”. Graduate students of RTG2157 3D Infect at Würzburg University advance and employ 3D human tissue models to investigate host-pathogen interactions. The purpose of these models is to reflect the natural infection site in humans to elucidate the molecular and mechanistic basis for interactions between host and microbes. This week, the Beilhack lab offered an intensive training course in immunology. The course addressed concepts in immunology and immunological methods with an emphasis on multicolor flow cytometry. Katja Ottmüller, Tim Steinfatt and Julia Hartweg provided not only theoretical background to the members of the RTG2157 but also hands-on training in laboratory techniques and in-depth data analysis. Infectious diseases remain one of the leading causes of death. A clear limitation of studying human pathogens is the lack of relevant infection models. This is particularly true for human pathogens for which no animal reservoir is known. 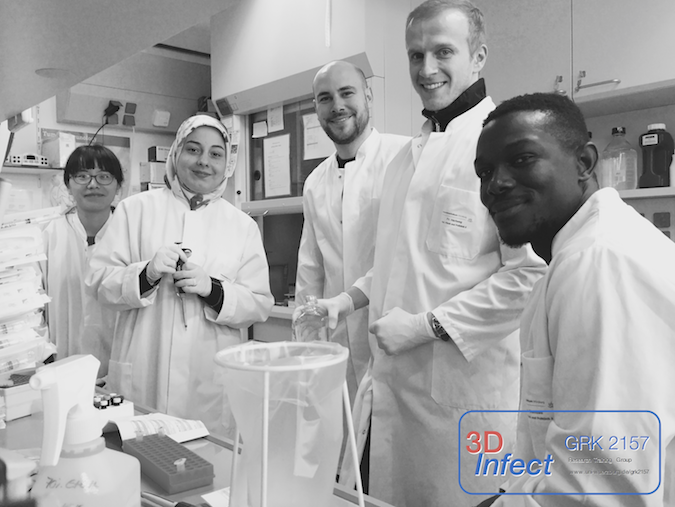 Since simple cell lines, cell culture systems or animals are highly artificial models for human pathogens the members of the DFG research training group RTG2157 3D Infect aims to develop and apply novel human 3D infection models based on engineered human tissues. In a joint project with the group of Prof. Markus Sauer, the Beilhack lab actively participates in this endeavor. The study of host-pathogen interactions is also in the Beilhack lab’s focus in the interdisciplinary DFG research consortium TRR124 FungiNet and in collaborations within the Center for Infectious Diseases (ZINF) at Würzburg University with the new Helmholtz Center for RNA-based Infectious Research in Würzburg. A new study lead by Prof. Kai Hildner from Erlangen University identifies BATF-expressing T cells as key players in intestinal acute graft-versus-host disease (GvHD). Alloreactive BATF+ effector memory T cells enhance inflammation by producing GM-CSF and augmenting the infiltration of innate immune cells in the intestinal mucosa. Zeng D, J Clin Invest 2018, © JCI. Surprisingly, the transcription factor BATF controlled the formation of a distinct IL-7 receptor signaling–responsive GM-CSF+ T cell subset. These newly identified pathologic IL-7RhiGM-CSF+ T cells link IL-7, a cytokine previously mostly associated with T cell reconstitution, to the occurrence of acute GVHD. Furthermore, the study revealed GM-CSF derived from alloreactive T cells as a major driver of systemic and intestinal GvHD. These findings pinpoint the newly identified IL-7R/BATF/GM-CSF axis as a promising therapeutic target to prevent or even treat acute GvHD in patients undergoing allogeneic hematopoietic cell transplantation. The new research article by Evelyn Ullrich et al. appeared today in the Journal of Clinical Investigation. The work resulted from a collaboration of an interdisciplinary team comprising several members of our newly founded DFG research consortium TR221 GvH-GvL between the partner universities Erlangen, Regensburg and Würzburg. Commentary by Prof. Defu Zheng on this article in the Journal of Clinical Investigation. On January 23rd principal investigators gathered for the inaugural meeting of the new DFG TRR221 collaborative research center on the modulation of graft-versus-host and graft-versus-leukemia immune responses after allogeneic stem cell transplantation in Regensburg. Allogeneic hematopoietic cell transplantation is a curative treatment regimen for many patients with leukemia and lymphoma. The new TRR221 consortium connects research teams from the universities of Erlangen, Regensburg and Würzburg to address key challenges of allogeneic hematopoietic cell transplantation. The efficacy of this therapy is mediated by the graft-versus-leukemia (GvL) effect by immune cells of the stem cell donor. However, this desired GvL does not occur to the same degree in all patients to prevent leukemia or lymphoma recurrence after allogeneic hematopoietic cell transplantation. Furthermore, the new forming immune system of the donor can attack healthy organ compartments of the stem cell recipients, an unwanted and often life-threatening immune reaction termed graft-versus-host disease (GvHD). Within the first five years after transplantation, about 60 percent of patients die from GVHD or leukemia. Our new interdisciplinary research consortium aims to develop innovative immunomodulatory strategies for specifically enhancing the GvL effect and for selective attenuation of GvHD. 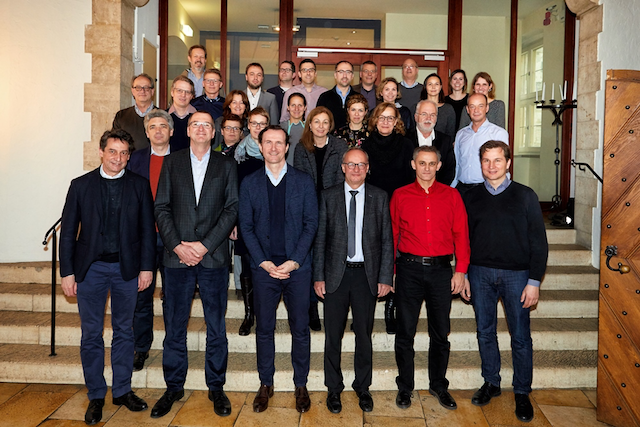 Our most recent meeting in Regensburg provided the opportunity to elect the board of the consortium, to define the key priorities for the near future, and, importantly, to exchange our most recent research results. A great start for an exciting opportunity to tackle together an unsolved medical problem and to help patients through a concerted research effort.